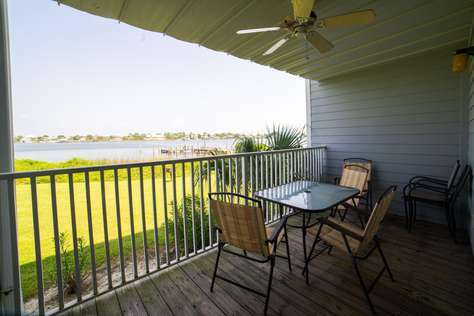 *Waterfront* to Ole River | 1st Floor A13 | Mullet Toss Available! This 2br/2ba condo is located on the 1st floor of a three story building. The front faces the Gulf which is directly across the street. Relax on the private balcony under the ceiling fan and watch the boats go by on Ole River with a wonderful view of Ono Island. This condo is stocked with all the necessary items to make you feel at home. Enjoy the fully stocked kitchen where you will find all you need to cook up your favorite meal including a blender to mix your favorite drinks. The living room is furnished with a Queen size sofa sleeper and a TV with cable. It also has great views of the boat docks and ole river. The master bedroom has a king size bed and a bathroom that has an oversized walk in shower. The second bedroom is nicely furnished with two twin beds. For your convenience there is a full size washer and dryer inside the condo. Amenities include a large swimming pool, basketball court, tennis court, BBQ grills, boat docks and a boat storage yard. Across the street from Sundown is The Crab Trap restaurant. Flora Bama Restaurant and Bar is only one mile from Sundown. We invite you to come enjoy our 2br/2ba waterfront condo located on the 1st floor at Sundown Condominiums in Perdido Key. We have stocked the condo with our guest in mind. You will find all you need to make yourself feel at home. The Master bedroom has a Queen bed and a futon that you may use as an extra bed if you need to. It also has a bathroom with a walk in shower. The 2nd bedroom has a Queen bed, bunks with twin on top, full on bottom and a twin trundle. 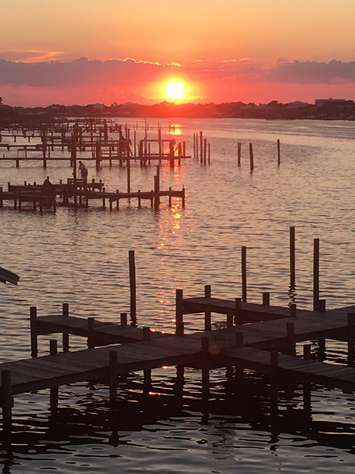 The serenity of Perdido Key is a treasure only a few know. Sundown is a private, peaceful, low-rise condo complex on the Key that is truly a hidden gem. Positioned on scenic Ole River, Sundown has a private walkway to the beach and offers access to water recreation of all types. It offers a large pool, tennis and basketball courts. Picnic areas with barbeque grills are near the pool and by Ole River. Cable and wireless internet are provided. For boat lovers, there are boat slips, jet ski moorings, and storage for trailers. A boat launch is available for your use nearby. The Coastal Suite is a one bedroom, one bath, third floor condo with a large deck that offers the best waterfront views in the complex. The sunsets are breathtaking and stargazing with the provided telescope is magical. Watch the birds soar and dive for food as you sunbathe on the deck while dolphins make their daily pass on the river. The Coastal Suite has multiple amenities. The kitchen is abundantly stocked with equipment for home cooking and entertaining. The guest closet has beach chairs, beach umbrellas, beach and pool toys, and other goodies. Fishing gear and crab traps are provided for those who want to try their luck. The bedroom has an elegant and comfortable king size bed and a television. For those bringing little ones, a pack and play has been provided for your convenience. In the living room there is a large flat screen TV for television and movie viewing and a sound system for playing DVD's, CD's, and I-pods. This condo is a one of a kind getaway that you will not want to leave. Ask for B-34, the Coastal Suite, and make your own special memories at Sundown Condos in Perdido Key. Call or email the manager for available dates. This waterfront condo with 1 bedroom 1 bath located on the 3rd floor is the perfect choice for any family. The kitchen is stocked with all the necessities you will need to cook as if you're at home. And don't worry about washing dishes, there is a dishwasher for that. We have provided a Keurig coffee pot and regular drip coffee pot. The living room is nicely decorated and comfortable for the whole family. The sofa has a Queen size sleeper. Also provided is a Pack-N-Play to accommodate the little one. The bedroom has a King size bed and cable TV. In the closet you will find a pull out cot for your convenience. The bathroom in this condo has a tub/shower combo. The huge roof top balcony has seating for everyone. It is partly covered so you can have use of the balcony with shade, or pull the chase lounges into the sun for that Vitamin Sea! Our amenities include Free use of the boat docks and the boat/trailer storage yard. Free WIFI and TV Cable in the living room and bedroom. We offer Free parking to our guest. For the athletes we have a tennis court and a basketball court. Cool off in one of the largest pools on Perdido Key. 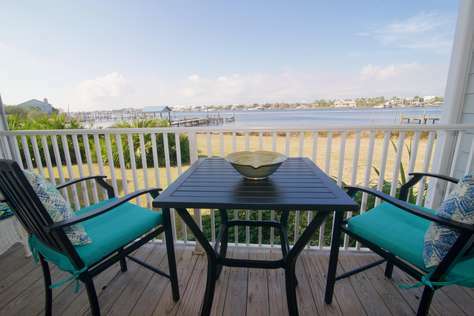 Directly across the street is the beach and use of our private boardwalk. Right next door to our boardwalk is The Crab Trap restaurant if you'd like a quick snack, dinner, or a drink beach side. There's plenty to do for the entire family. Bring your crab baskets and fishing poles for fun at the docks. There are several BBQ grills placed around the property. What are you waiting for?? See you at the Beach!! Sundown is a private, peaceful, low-rise condo complex on the Key that is truly a hidden gem. Positioned on scenic Ole River, Sundown has a private walkway to the beach and offers access to water recreation of all types. It offers a large pool, tennis and basketball courts. Picnic areas with barbeque grills are near the pool and by Ole River. Cable and wireless internet are provided. For boat lovers, there are boat slips, jet ski moorings, and storage for trailers. A boat launch is available for your use nearby. The Nautical Suite is a one bedroom, one bath, third floor condo with a large deck that offers the best waterfront views in the complex. Sunset is breathtaking and stargazing with the provided telescope is magical. 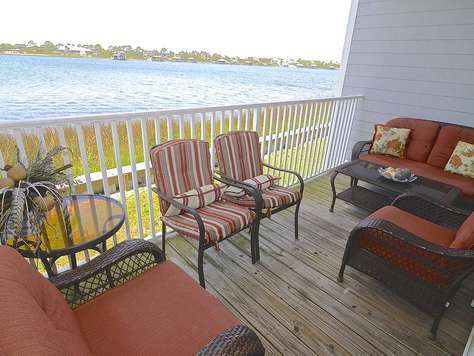 Watch the birds soar and dive for food as you sunbathe on the deck while dolphins make their daily pass on the river. The Nautical Suite has multiple amenities. The kitchen is abundantly stocked with equipment for home cooking and entertaining. The guest closet has beach chairs, beach umbrellas, beach and pool toys, and other goodies. Fishing gear and crab traps are provided for those who want to try their luck. The bedroom has an elegant and comfortable king size bed. There is a large flat screen TV for television and movie viewing and a sound system for playing DVD's, CD's, and I-pods. This condo is a one of a kind getaway that you will not want to leave. 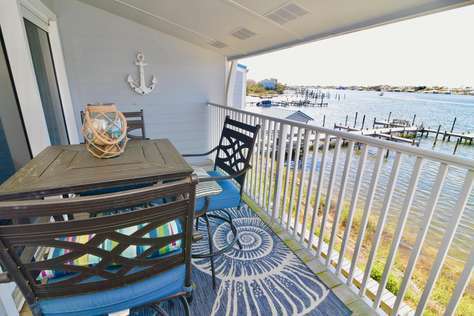 Ask for B-35, the Nautical Suite, and make your own special memories at Sundown in Perdido Key. If you need to book two condos for traveling friends and family we also rent our condo B-34 which is right beside B-35. Escape from the overcrowded high rise condos and come relax in Perdido Key at Sundown Condominiums. The low density complex is located across the street from the Gulf of Mexico on Ole River. You can enjoy the beach and boating when staying at Sundown. The complex has two boat docks where slips are available on a first come first serve basis. DEEDED BEACH ACCESS! With a short walk across the street you can take the boardwalk right down to the sandy beaches. Unit C-33 is a top floor 1 Bedroom 1 Bath unit with a large deck that is half covered and half uncovered. So you don't even have to leave the unit to work on your tan! From the top floor you'll also get to experience amazing sunsets and watch all the boaters and dolphins going by. From the kitchen you'll even have unobstructed views of the Gulf! Charcoal grills by the pool and by the river. Welcome to D22! Recent Updates. New Pictures Soon! Escape the crowds with this low density Sundown Riverside Condo w/ comfortable accommodations for 8. 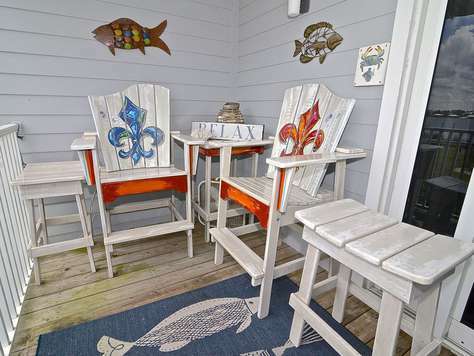 Across the street, explore the white sandy beach, with deeded access and a private boardwalk. Come home & relax on your private, shaded balcony taking in a gorgeous panoramic view of the Old River, overlooking Ono Island. Watch the beautiful sunsets, boaters, skiers, and dolphins... If you are a boater or fisherman you have the best of both worlds. 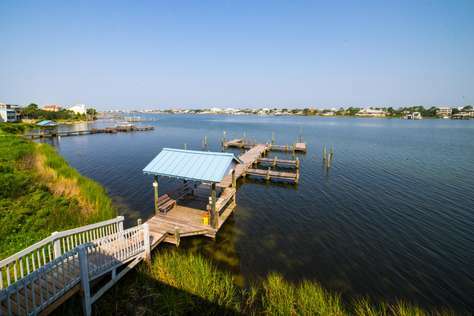 With free access to private boat docks out on a pier with ocean access. This condo complex offers a large Olympic sized pool, tennis & basketball court. -All mattresses are brand new and include safety covers. Come stay at our place, you wont be sorry! Opps forgot to mention complementary coffee, ocean toys, umbrellas and ocean chairs. We have a three bedroom end unit on the first floor. Our family has been enjoying this condo for years. We invite you to experience what has made us fall in love with Sundown and the Perdido Key area. Get ready to make memories!! If you are looking for a beach vacation to just get away from the hustle and bustle, slow down and relax you have found it. That's what you get with Sundown and Perdido Key. The kitchen is furnished with all you should need to prepare your family favorites. When you don't want to cook visit some of our great local restaurants. Two of the bedrooms and the living room have cable TV's. Sundown has a basketball court, tennis court and one of the largest swimming pool on the island. We have boat docks and invite you to bring your boat. We have a storage yard for your boat trailer. Excellent views of the docks and Ole River from the balcony. 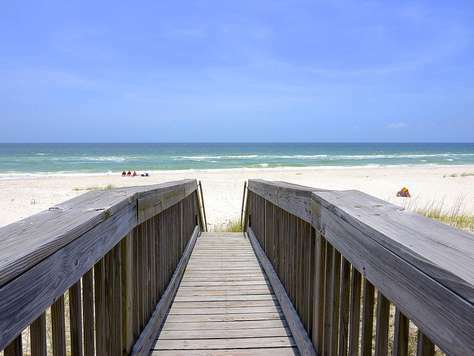 You can walk across the street to our private board walk leading you to the beach. Welcome to Sundown, unit A-14! Sundown unit A-14 has undergone a full renovation in the fall of 2018. Many upgrades were added that enhanced the already spacious floor plan. 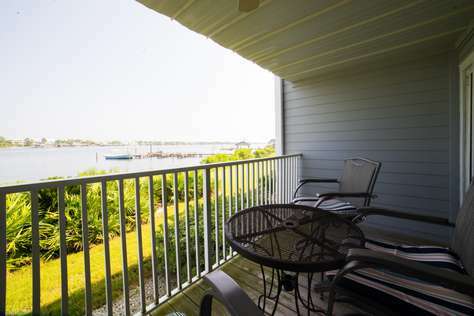 This waterfront, first floor, three bedroom, two bath unit sleeps 12 comfortably. With all new furniture, mattresses and bedding the clean, fresh beach vibe carries throughout the unit. The master bedroom suite features a king size bed, large closet and on-suite bathroom with tile, walk in shower. The second bedroom features a queen size bed and an oversized chair that has a hidden twin size memory foam sleeper. The third bedroom is perfect for all the kiddos in your crew featuring two full size beds and two twin size trundle beds. This bedroom connects to the second bathroom making it easy to access through the bedroom or the main hallway. Both couches in the living room are sleeper sofas. One is a full size memory foam mattress and the other a queen size. They both cannot be used at the same time but you can take your pick as to which size fits your sleeping arrangement needs the best. With a fully stocked kitchen for all your cooking needs and a deck fit for family enjoyment you may not want to leave. 11. Apple home pod allowing voice control of thermostat and many other items. Also allows access to Apple Music Radio (play almost any song just by asking Siri). 25. Crate located on the deck that contains Frisbees, football, volleyball, basketball, soccer ball, etc. 26. Outdoor closet with pool noodles, beach chairs, sand toys, etc. 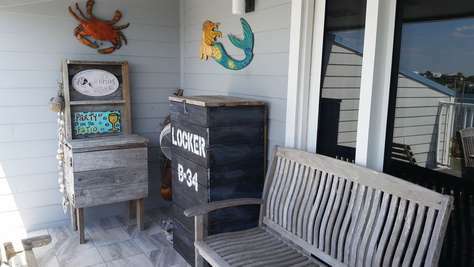 for your use or just use the extra storage to put your own beach toys and fishing gear. Sundown is a family friendly condominium community, situated on Ole River in Perdido Key, Florida. Sundown has on site management and you will be greeted by a friendly face upon your arrival. Due to management being on site you can rest at ease knowing if you have any questions, concerns or comments during your stay someone is there to talk to. Sundown is a boat friendly community with a unique first come first serve plan. In a nut shell, you are given a tag, not for your boat but for a slip, simply go pick out a boat slip upon check-in, place the tag on it and it’s yours for your stay, no moving around the dock or hoping you have a space when you head back in from a day out on the water. A fully fenced, gated and locked boat yard is also on site for you to lock up your boat trailer. A couple of mooring balls are located close to the docks as well, providing the perfect place to tie up your stand up paddle board, kayak or jet skis. With only 47 units and county owned land across the street you have uncrowded access to the beautiful emerald green waters of the gulf. Sundown has a private deeded board walk to the beach making for quick and easy access to that sugar white sand that is calling your name. Even though it is a short walk across the two lane road to get to the beach, the time it takes to get from your unit to the beach is much shorter than staying in many of the high rise beach front condos and waiting on the elevator. Sundown has tennis courts, basketball courts and a large Olympic size swimming pool for your enjoyment. The two boat docks not only provide ample space for your boat during your stay but they also provide a great atmosphere for fishing (complete with fish cleaning stations), crabbing, and watching the sunset (benches are provided on the docks). Outdoor grills are located on the property so you can grill your catch of the day or enjoy a burger with the family. If you don’t feel like grilling though, The Crab Trap restaurant is located just feet away from the Sundown boardwalk. A-14 is our little piece of paradise, our second home that we want to share with other families to use as their second home during their vacation. We designed this unit to appeal to families. It boasts some unique things to others in the complex. A-14 has had many upgrades during the recent renovation, as you can see from the pictures. It has a beach house feel to it and one that is sure to make you feel like you are at an island paradise retreat. Please take a look at our pics and come enjoy your beach house! Relax, slow down and enjoy life. In Perdido Key that's the way of life. Come enjoy our special spot on the island. In our 3BR / 2BA condo at Sundown is the perfect spot for your family getaway. We furnished our condo with families in mind. There are enough beds to sleep most families. All bedrooms have TV's. The kitchen has everything you would need prepare your favorite meals and feel at home. Is is open to the dining area and the living room with beautiful views from each room. A washer and dryer is furnished for your convenience. The balcony is a favorite spot for most. Enjoy beautiful views of ole river. You can bring your boat and tie up to our boat docks. We have a storage yard you can park your boat trailer. Directly across the street is our private beach boardwalk. Sundown is the perfect place to enjoy the beach and Ole River all in one place. Enjoy a refreshing swim in the largest swimming pool on the island. Also on our property is a tennis court and basketball court. We invite you to come enjoy our 2br/2ba waterfront condo located on the 2nd floor at Sundown Condominiums in Perdido Key. The Master bedroom has a King size bed and it's own bathroom. The 2nd bedroom has two twin beds and a sofa sleeper. The 2nd bathroom is located just outside the bedroom in the hallway. With the decor of this condo, the comfort of the furniture, the beautiful views and relaxing balcony you will be tempted to spend your vacation at the condo. When you do venture out you will find that Sundown is laid back, quiet and inviting. Enjoy the basketball court, tennis court and the large swimming pool. 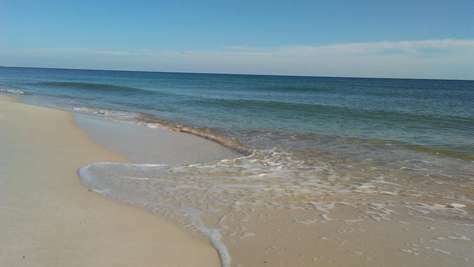 Walk across the street and enjoy the white sandy beaches of Perdido Key. Our family has enjoyed this condo for years, making memories with our children and grandchildren. We invite you come and experience our paradise and make memories of your own. The Master bedroom has a King bed. It also has it's own bathroom. The 2nd bedroom has two sets of bunk beds. You will have access to FREE WIFI and Cable TV. Come see why our family fell in love with Perdido Key and Sundown Condominiums. The Master bedroom has a King bed and a private bathroom. The 2nd bedroom has two twin beds. This condo has many repeat guest and is a first choice for new guest. We stocked this condo so you will find all you need to make yourself feel at home. The Master bedroom has a Queen size bed. It also has a bathroom with a walk in shower. The 2nd bedroom has two twins and a futon. We furnished our condo with you in mind. We tried to think of everything you will need to make this your home away from home. This one bedroom, one bath condo has free Wifi, cable TV in the living room and the bedroom and even a telescope to enjoy from our roof top balcony. The bedroom has a King size bed and in the sofa in the living room includes a Queen size sleeper. The large top floor balcony has a shaded area and a sunning area. 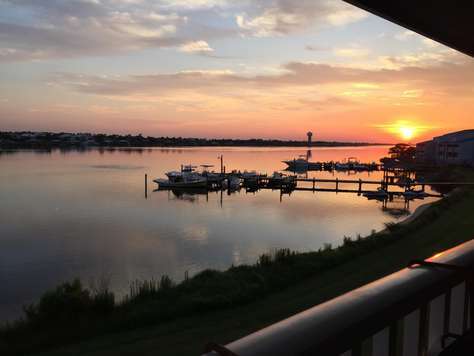 Watch dolphins play in Ole River from your balcony. Watch boats go by and enjoy the views across the water to Ono Island. The kitchen, dining and living room are all opened with a beautiful view of Ole River. Linens are furnished in the condo and so is a washer and dryer so you can wash and reuse. 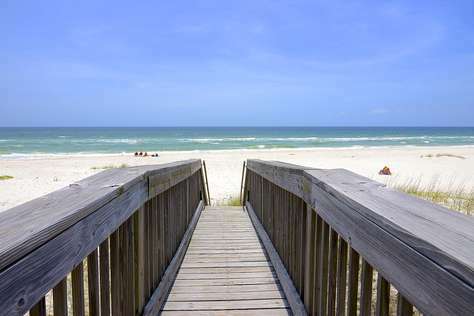 The beach is only across the street and we have a private boardwalk for your use. Bring your boat, jet skis or kayaks and use Sundown's private boat docks and moorings FREE! One of the largest swimming pools on the island is right here at Sundown! Come enjoy it and our other amenities. We have a tennis and basketball court, boat docks, private storage yard for your boat trailers and a boardwalk to the beach. Give us a call or book online. Memories are Waiting! First floor, 3bed/2bath Beach Cottage Condo! Come relax at Sundown, unit D-14! Sundown unit D-14 is a waterfront, first floor, three bedroom, two bath unit that sleeps 10 comfortably. This is a quiet end unit with a more private entrance and very little foot traffic on the board walk. It also features a large grassy area in front of the deck where the kids can play while the grown-ups relax in the shade. The master bedroom suite features a King sized bed, large closet and on-suite bathroom with tile floors and walk-in shower. The second bedroom can be used as another master suite and features a Queen sized bed. The third bedroom is perfect for all the kiddos in your crew featuring a Queen sized bed, a twin over full bunkbed and a twin sized trundle bed. This bedroom is adjacent to the second bathroom making it easy to access through the main hallway. With a fully stocked kitchen for all your cooking and cocktail needs, and a deck fit for both relaxation and family enjoyment you will be sure to enjoy your beach vacation, and hopefully return year after year for more. Sundown is a family friendly condominium community, situated on Ole River in Perdido Key, Florida. With onsite management, you will be greeted by a friendly face upon your arrival and if you have any questions, concerns or comments during your stay, someone is there to help. Sundown is a boat friendly community with a unique first come first serve plan. Upon arrival, you are given a tag for a slip, simply go pick out a boat slip upon check-in, place the tag on it and it’s yours for your stay. No moving around the dock or hoping you have a space when you head back in from a day out on the water. A fully fenced, gated and locked boat yard is also on site for you to lock up your boat trailer. A couple of mooring balls are located close to the docks as well, providing the perfect place to tie up your stand up paddle board, kayak or jet skis. The two boat docks not only provide ample space for your boat during your stay but they also provide a great atmosphere for fishing (complete with fish cleaning stations), crabbing, and watching the sunset (benches are provided on the docks). Sundown has a private deeded board walk to the beach making for quick and easy access to that sugar white sand that is calling your name. 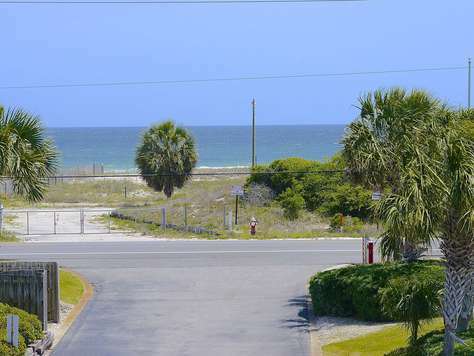 Even though it is a short walk across the two lane road to get to the beach, the time it takes to get from your unit to the beach is much shorter than staying in many of the high rise beach front condos and waiting on the elevator. 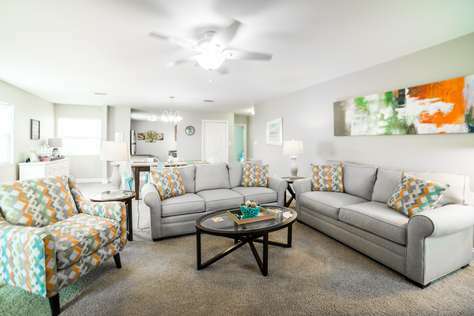 With only 46 units and county owned land across the street you have access to the beautiful emerald green waters of the gulf, you will have plenty of space to spread out and not be crowded. Sundown also has tennis courts, basketball courts and a large Olympic size swimming pool for your enjoyment. D-14 is very conveniently located to all of these available amenities, as they are just outside your door. Outdoor grills are located on the property so you can grill your catch of the day or enjoy a burger with the family. One is located right in front of D-14 for your grilling convenience. 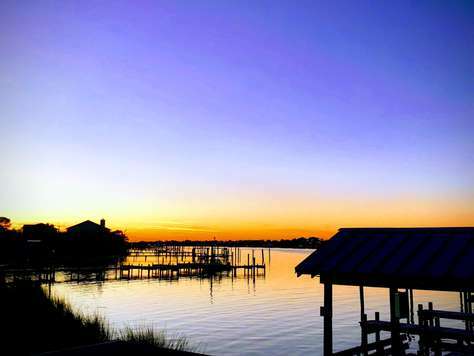 If you don’t feel like grilling though, The Crab Trap restaurant is located just feet away from the Sundown boardwalk. And the sunsets from the deck are stunning, perfect for a glass of wine or the cocktail of your choice at the end of a day on the beach. D-14 is our “Happy Place” and we want to share with you to use as your second home during your vacation. We designed this unit to appeal to families beach cottage feel that is sure to make you relax and unwind. Please take a look at our pics and come enjoy the beach! Sundown has taken every precaution to ensure accuracy, however, we reserve the right to correct errors. Welcome to C32 in Sunny Perdido Key, Florida. We are waterfront to Ole River which is only across the street from the beach. Your view of Ole River is amazing. You can relax on your balcony while watching dolphins play, watch the fishermen on the docks and enjoy the scenery of the boats going by. Unit C-32 is a top floor condo. From the top floor you'll get to experience amazing sunsets. From the kitchen you'll even have unobstructed views of the Gulf! There was no holding back when it came to furnishing this unit. Even though it's a one bedroom we made sure the sleeping arrangements covered all the family to have a comfortable night's sleep. You will find a King size bed in the bedroom. In the living room there are two fold down beds. One is a Queen size and the other is a Twin. Including the sofa sleeper this condo sleeps 7. In the Kitchen you will find all you need to feel at home while making your favorite meals. Both the bedroom and the living room have large TV's. Sundown offers Free Cable and Wifi. Besides all the condo has to offer you will love the grounds. Sundown has a large swimming pool with bath house, basketball court, tennis court, boat storage yard, two fishing docks with boat slips, BBQ grills near the swimming pool and the boat docks and a private boardwalk to the beach. Perdido Key offers a lot of water sports such as kayak rentals, parasailing, banana boat rides, jet ski rentals, paddle board rentals and boat rentals. Our boat slips and jet ski moorings are free to our guest. If you like the nightlife, great food, and shopping you will be happy to know Sundown is centrally located to all of these. Perdido Key has the best seafood in the area! Stop by our onsite office to find out where the locals eat. Book Online or if you prefer to use a vacation planner give us a call and we will personally help you plan your vacation at Sundown Condominiums in Perdido Key, Florida. 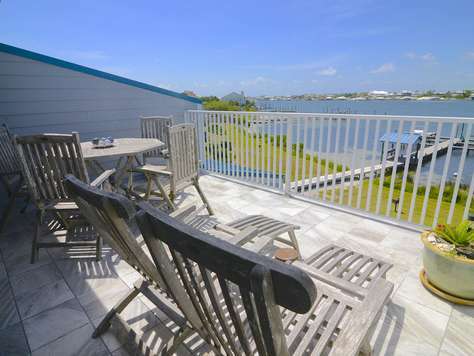 Sundown Condominiums in Perdido Key, Florida offers 1, 2 and 3 bedroom vacation rentals. Our summer season is mid May through the first week of August with June and July being the busiest. August, September and October have fall rates and November, December, January and February have our winter rates and monthly rates. March and April through mid May is Spring Break season. We would like to share our little piece of paradise with you. This two bedroom, two bath condo is perfect for a family getaway. With an open kitchen, living and dining area you can see the water view from each of those rooms. The living room has sliding doors opening to the balcony which has comfortable furniture accommodate the family. You will see some of the best sunsets from the balcony. It's a peaceful spot to sit and watch the boats go by and see the dolphins play. Inside the condo you have everything you need to feel at home. The kitchen is stocked well for you to prepare meals. The living room has comfortable seating and it has a sofa sleeper. Free cable and wifi are available. The Master bedroom has a King size bed and a Master bathroom with a beautiful walk in tile shower. Cable TV is available in this bedroom. The 2nd bedroom has two Queen size beds. The 2nd bathroom is located in the hallway just outside the 2nd bedroom. It is a full bath with a bathtub/shower combo. Sundown is a small complex in Perdido Key. Perdido Key is laid back and not over crowed. We are located on Ole River and the BEACH is only across the street. No driving required. We have a large pool and a tennis and basketball court. We have FREE boat slips where you can dock your boat and we have a storage area for your boat trailer. Our condo has a keyless entry for added convenience. Another convenience is the full size washer and dryer inside the condo. Check-in is at our onsite office and after hours check-in is available.